Published May 30, 2018 in Journal for ImmunoTherapy of Cancer (JITC) as "An update on the Society for Immunotherapy of Cancer consensus statement on tumor immunotherapy for the treatment of cutaneous melanoma: version 2.0 ." The following are current (as of July 27, 2018) treatment algorithms for the SITC Cancer Immunotherapy Guidelines - Cutaneous Melanoma. Figure 1. 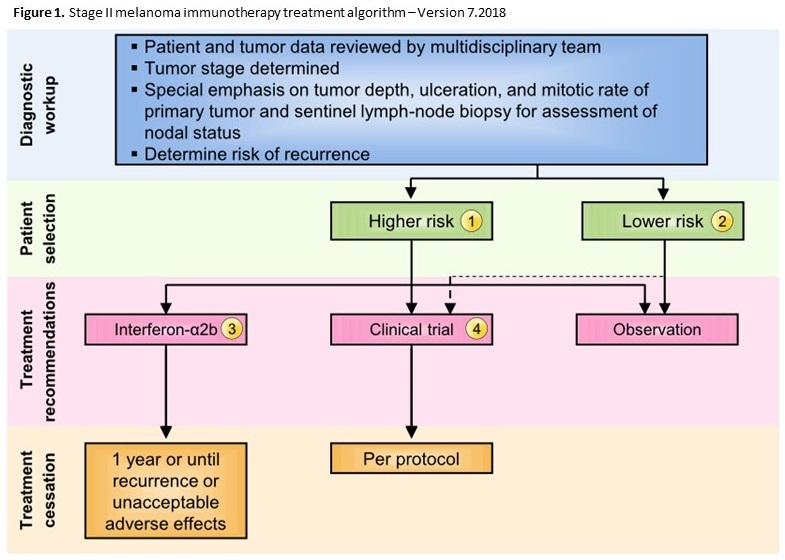 Stage II melanoma immunotherapy treatment algorithm. All treatment options shown may be appropriate, and final selection of therapy should be individualized based on patient eligibility and treatment availability at the physician’s discretion. These algorithms represent consensus sequencing suggestions by the panel. (1) High-risk disease is defined as tumors >4 mm in depth (with or without ulceration) or >2-4 mm with ulceration. There is limited consensus on adjuvant therapy for this group with 10% of the panel recommending interferon‑α2b, 20% recommending observation, 45% and 15% recommending therapeutic and/or biomarker-based clinical trial participation, respectively, and no panelists recommending pegylated-interferon‑α2. (2) There is no evidence that immunotherapy is useful in patients with lower risk stage II melanoma, although the panel did recommend clinical trial participation, if available. Protocol-specific eligibility would need to be followed to select appropriate study candidates. (3) Patients should have a good performance status without evidence of significant depression, psychiatric history or underlying autoimmune disease to be considered for interferon‑α2b. There are limited data available on interferon‑α2b as treatment for stage II disease. (4) Clinical trials were the preferred treatment recommendation for patients with stage II disease associated with higher risk of tumor recurrence. Figure 2. 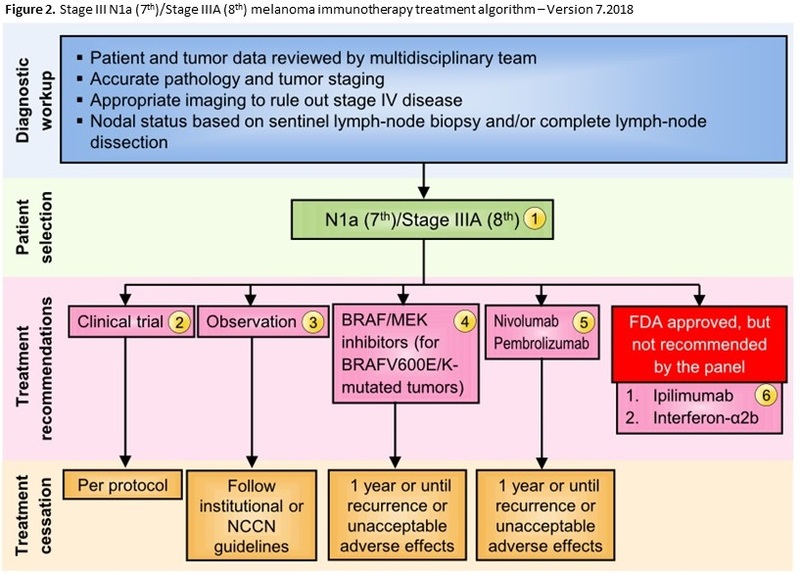 Stage III N1a (7th)/Stage IIIA (8th) melanoma immunotherapy treatment algorithm. The consensus of the panel was to separate Stage III N1a (based on AJCC 7th edition) and Stage IIIA (AJCC 8th) from other Stage III subsets based on lower risk of metastatic potential. However, a minority (30%) felt that all Stage III patients should be treated similarly. All treatment options shown may be appropriate and final selection of therapy should be individualized based on patient eligibility and treatment availability at the physician’s discretion. These algorithms represent consensus sequencing suggestions by the panel. (1) There are limited data on the role of adjuvant therapy following sentinel lymphadenectomy alone, which is anticipated to become more common. (2) The majority of the subcommittee noted that enrollment into an appropriate clinical trial, if available, is always the initially preferred option for this subset of patients. (3) If clinical trial enrollment is unavailable for a specific patient, 67% of the subcommittee recommended observation of disease per institutional or National Comprehensive Cancer Network guidelines. (4) There is Level A evidence to support the use the combination of dabrafenib and trametinib in patients with BRAF V600E/K mutant, Stage III melanoma independent of the volume of lymph node involvement or the number of lymph nodes involved. (5) A minority of the subcommittee (21%) selected anti-PD-1 therapy as an option for this patient population. Level A data supports the use of nivolumab over ipilimumab was demonstrated in patients with Stage IIIB to IV resected melanoma, but did not include patients with Stage IIIA (based on 7th) disease. (6) Despite FDA approval and select level A and B data, no panelists considered ipilimumab or interferon- α2b as their treatment of choice for patients with N1a/IIIA melanoma. Figure 3. 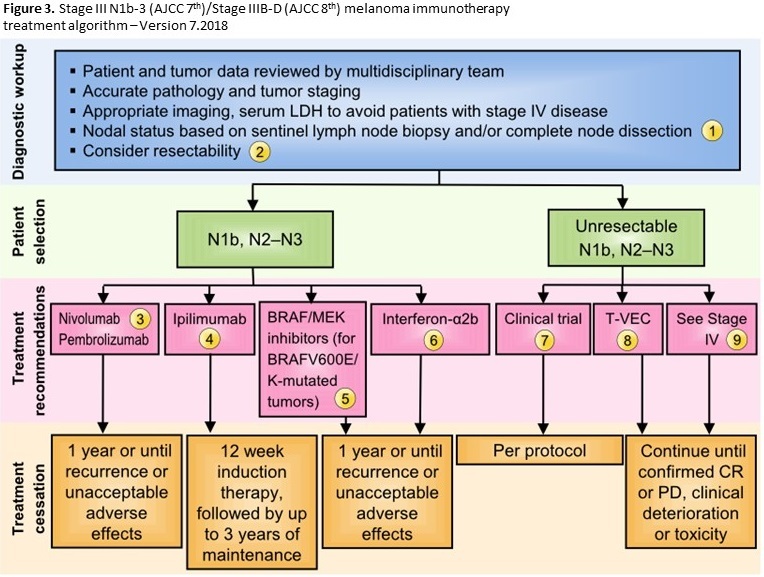 Stage III N1b-3 (AJCC 7th)/Stage IIIB-D (AJCC 8th) melanoma immunotherapy treatment algorithm. The consensus of the panel was to separate Stage III N1a (based on AJCC 7th edition) and Stage IIIA (AJCC 8th) from other Stage III subsets based on lower risk of metastatic potential. However, a minority (30%) felt that all Stage III subsets should be treated similarly. 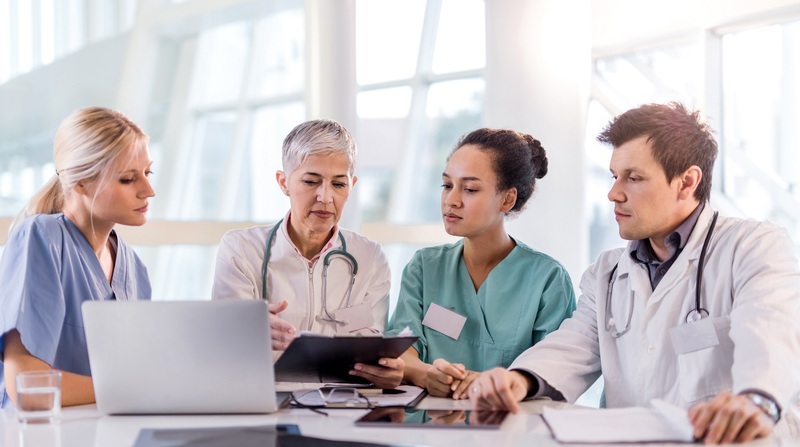 All treatment options shown may be appropriate and final selection of therapy should be individualized based on patient eligibility and treatment availability at the physician’s discretion. These algorithms represent consensus sequencing suggestions by the panel. (1) There are limited data on the role of adjuvant therapy following sentinel lymphadenectomy alone. (2) After evaluation by multi-disciplinary team with surgical oncology, if complete resection is possible patients should undergo resection followed by adjuvant therapy listed. If the tumor is considered unresectable, a different treatment paradigm should be followed. (3) In patients with Stage IIIB-IV resected melanoma, there is Level A evidence supporting the use of nivolumab over ipilimumab and pembrolizumab over placebo for stage IIIB-C and IIA patients with micrometastases > 1mm. Accordingly, nivolumab or pembrolizumab were supported by 46% of the panel. (4) Ipilimumab at 3 mg/kg was supported by a minority of panelists (8.3%). (5) There is Level A evidence to support the use the combination of dabrafenib and trametinib in patients with BRAF V600E/K mutant, Stage III melanoma. (6) While there are Level A data that 1 year interferon‑α2b is associated with improvement in RFS, no panelists recommended considering this therapy for this patient population. (7) Overall, the majority of panelists recommended a clinical trial, if available. (8) The majority of the panelists have had experience with T-VEC, and half of respondents said they would recommend T-VEC for first-line treatment for limited disease burden, and a significant minority (39%) would consider T-VEC for patients with locoregional disease. (9) Unresectable disease could be managed by options available for stage IV patients (see Figure 4). Abbreviations: CR, complete response; LDH, lactate dehydrogenase; NCCN, National Comprehensive Cancer Network; PD, progressive disease; RFS, recurrence‑free survival, TVEC, talimogene laherparepvec. Figure 4. 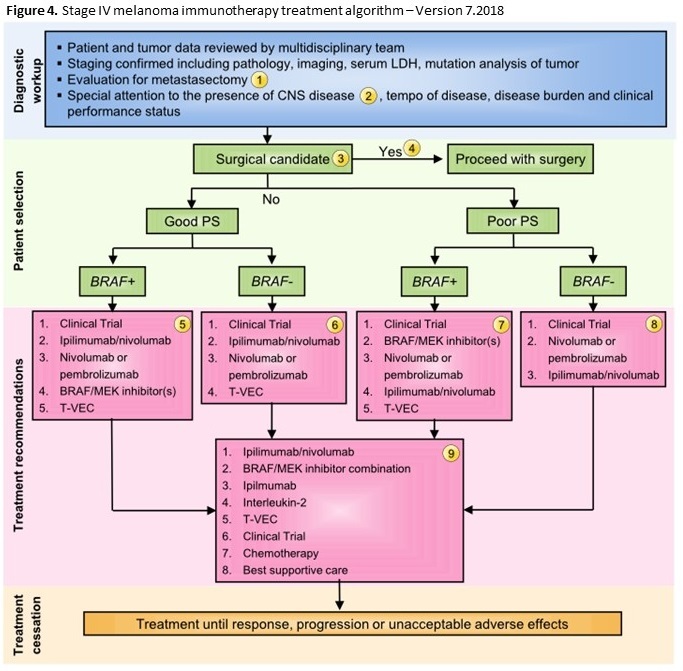 Stage IV melanoma immunotherapy treatment algorithm. All treatment options shown may be appropriate and final selection of therapy should be individualized based on patient eligibility and treatment availability at the physician’s discretion. These algorithms represent consensus sequencing suggestions by the panel. The panel recommended all patients be evaluated with full body imaging, histopathology review, serum LDH, and tumor mutation analysis with emphasis on BRAF mutations. Other factors to be considered in selecting appropriate treatment should include performance status, burden and tempo of disease and presence of CNS metastases. (1) All patients should be evaluated for resection by a multi-disciplinary team including surgical oncology before and after immunotherapy treatment, although the role of surgery is changing and may be appropriate for patients with solitary pulmonary lesions where complete extirpation is possible; each case must be individualized. (2) All patients should have an MRI of the brain prior to treatment to rule out or manage CNS metastasis. These consensus recommendations are generally for patients with no CNS disease or CNS disease that has been treated and controlled. In patients with CNS metastases, the subcommittee recognizes emerging data concerning combination nivolumab + ipilimumab, and a minority of panelists (33.3%) recommended stereotactic radiation prior to systemic therapy for CNS lesions. (3) There is level B data for a clinical benefit with surgical resection when complete excision of all disease is possible although first-line surgical resection was a minority opinion of the panel. (4) As determined by an experienced surgical oncologist, patient is eligible to receive surgical intervention as first-line treatment. (5) For any patient with a good performance status and actionable BRAF mutation status, clinical trial was the favored first line approach by the panel. In the absence of an appropriate clinical trial, 46% of the panel recommended combination ipilimumab and nivolumab based on the high response rates reported. 29% of the subcommittee recommended single agent anti-PD-1 therapy (pembrolizumab or nivolumab), while only one member recommended treatment with BRAF/MEK inhibitors. Some panel members also noted that T-VEC in patients with accessible tumor for injection and limited visceral tumor burden may be an option, especially for elderly patients and those not eligible for checkpoint inhibitors. (6) Clinical trial enrollment was favored as the primary treatment option for any patient with a good performance status and no actionable BRAF mutation status. 50% of the panel recommended combination ipilimumab and nivolumab for these patients if clinical trial enrollment is unavailable. 33% of the subcommittee recommended single agent anti-PD-1 therapy, and again noted T-VEC as an option for select patients as described above. (7) In patients with poor performance status and a BRAF mutation who are not eligible or whose tumors progress after a clinical trial, 79% of the panelists recommended treatment with a BRAF and/or MEK inhibitor. This option was also considered appropriate for patients with uncontrolled CNS disease. Single agent anti-PD-1 treatment was recommended by 21% of the subcommittee for this patient population. (8) The majority of the subcommittee recommended clinical trial enrollment for patients with poor performance status and no actionable BRAF mutation. Outside of clinical trial enrollment, 71% of members recommended single agent anti-PD-1 therapy, while 25% recommended combination nivolumab + ipilimumab. One subcommittee member suggested single agent ipilimumab as an option for these patients. (9) In patients with disease progression following the first-line recommendations, management should be carefully considered. If patients can tolerate treatment, ipilimumab/nivolumab should be considered. If patients have a BRAF mutation and have not been treated with BRAF/MEK inhibitors previously these can be considered. Ipilimimab monotherapy and high-dose IL-2 can also be considered in these patients. Patients should have a good PS and otherwise qualify for IL‑2 administration per local institutional guidelines. Dacarbazine is the only approved chemotherapy agent but temozolomide and carboplatin/paclitaxel are often used as well depending on patient preference and physician experience. Abbreviations: BRAF+, positive for actionable BRAF mutations; BRAF–, negative for actionable BRAF mutations; CNS, central nervous system; IL, interleukin; LDH, lactate dehydrogenase; PS, performance status.